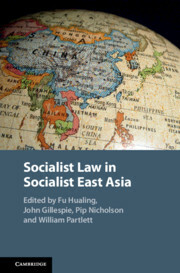 "Diverging Trends in the Socialist Constitutionalism of the People's Republic of China and Socialist Republic of Vietnam"
Introduction: This chapter provides an overview to comparative study of Sino-Vietnamese comparative constitutionalism by exploring the bases of three core, substantive pillars of socialist constitutionalism through the Sino-Vietnamese comparison: insistence on Party leadership, reliance on socialist rule of law, and adaptation to populism. After considering several examples of how constitutional rules are currently operating through political and popular constitutionalism in all three areas, we conclude that Vietnam is presently moving in a direction offering more prospects for convergence with international norms, as the current Vietnamese Party-state is relatively less politically monolithic, more open to the influence of international laws, and more tolerant of civil society than its Chinese counterpart. That being the case, we predict that Vietnam will likely continue to depart from the increasingly insular Chinese model of constitutional development for the foreseeable future. The chapter can be downloaded from SSRN from here.